First Vice President of the European Commission Frans Timmermans was a panelist at the 10th Lennart Meri Conference in Tallinn that ended on Sunday. In an interview with ERR's Neeme Raud, he said that the EU needed to show that it was making progress, and to explain more, so people could see its value. 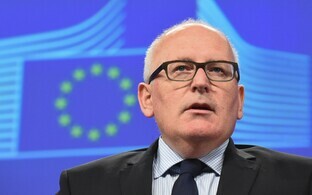 Timmermans said that the European Union faced many challenges, the migration crisis and international terrorism, but also the economic situation and the sobering fact that for the first time in decades, the next generation wouldn't be doing better than their parents. Asked about current criticism of the union and anti-EU political movements in plenty of member states, Timmermans said that though he didn't want to blame anyone in particular, the politicians had failed to show that the EU could make progress. Managing the expectations of the public was one such point he brought out. In plenty of member states, politicians had overpromised and underdelivered when it came to the actual influence of the EU, Timmermans said. There was also a tendency to attest successes to national politics and blame failures on the union. The EU needed to demonstrate where it was successful, he added. The flow of refugees into EU territory, for instance, had been reduced from 6,000 to 50 people arriving a day, and where refugees drowned in the Aegean Sea by the hundreds, this situation had now changed for the better. It was in demonstrating the capabilities of the union in such examples that politicians needed to explain its importance for Europe. Watch the full interview by clicking the play button above.